This dovetail bit has a cutting diameter of 3/4", and angle of 14° and a cutting height of 25/32". 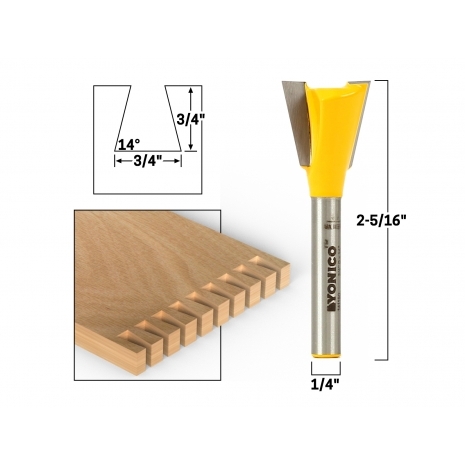 The shank diameter is 1/2"
The dovetail is probably the most recognizable of all woodworking joints. A dovetail joint is self-aligning and interlocking. There are numerous versions of the dovetail joint, including half blind dovetails, through dovetails, mitered dovetails and sliding dovetails. All of these variations are common in casework and drawer construction. A single dovetail bit can make almost any kind of dovetail, depending on the desired size. You'll need a jig to make most dovetail joints, as well as a guide bushing for your router. Check the instructions with your dovetail jig to select a bit with the appropriate angle, which will usually be somewhere between 7 and 14 degrees.